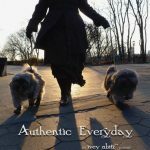 A feature from Authentic Everyday. Buy the magazine here. We have debuted dozens of collections over the past ten years. With each new collection, we debut new garment designs that are meant to mix and match with previous collections. This allows you to build upon and expand your IA collection to create a one-of-a-kind wardrobe that reflects your uniqueness. The following offers a closer look at select designs during their debuts, the meaning behind them, and how together they make Ivey Abitz what it is today. The Cordelia Shirt takes days to complete as each pin tuck is folded and sewn by hand. The Cordelia designs debuted in the autumn of 2006, including the Cordelia Shirt and Cordelia Skirt. The design collection grew to include the Cordelia Vest and Cordelia Dress in 2008. Each Cordelia takes days to complete as each pin tuck is folded and sewn by hand. 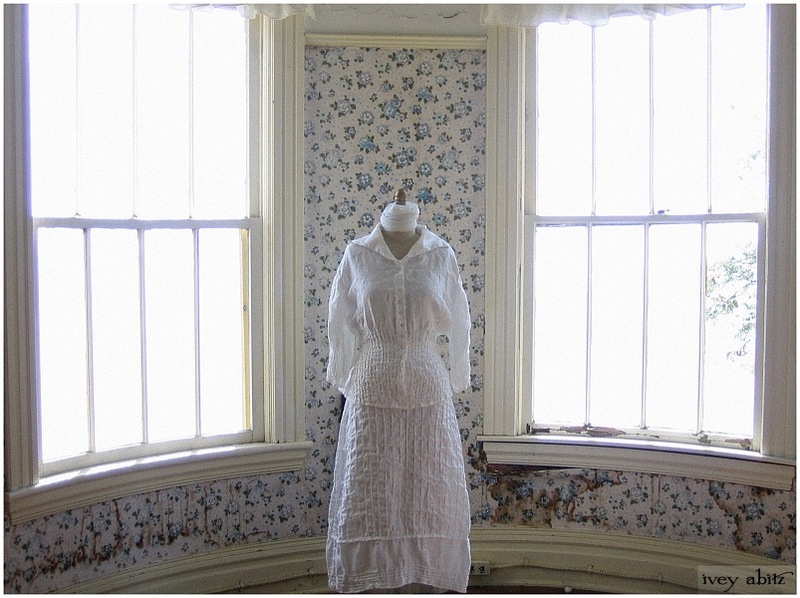 Celia Dress in a cottage where Celia spent some of her happiest days. 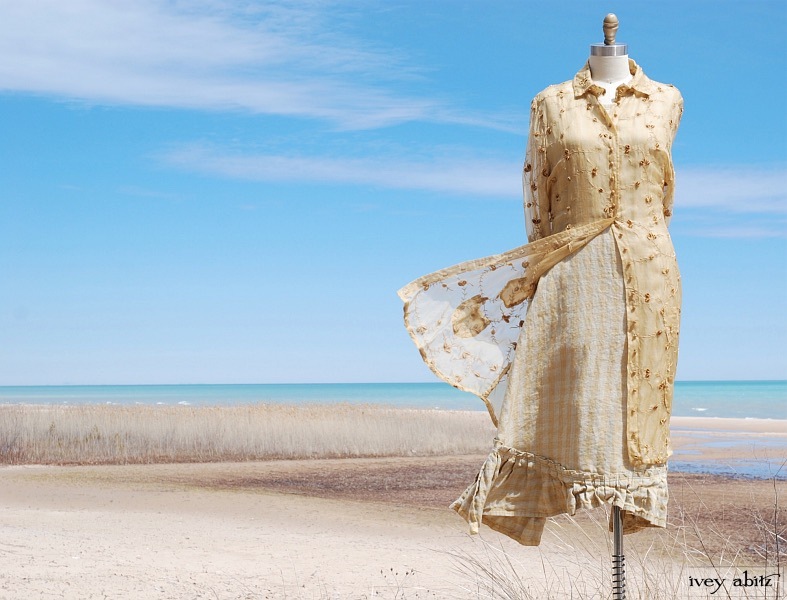 The Celia designs debuted in 2008, beginning with the Celia dress, shirt, frock, bag, and camisole. The collection now includes a duster coat, skirt, and pair of trousers. The collection is named after Cynthia’s grandmother, Celia, who encouraged her to be a dreamer. The Celia designs are in honour of such encouragement in life. They feature intricate layers of raw edges and gathers along the collars and bottom hems, representing the waves on the lake where Celia spent her happiest days. Blanchefleur Dress over a Blanchefleur Frock in cotton voile. The Blanchefleur designs debuted in 2010, beginning with the dress (with sleeves) and frock (sans sleeves). It soon became an entire design group complete with a jacket, duster coat, skirt, trousers, and sash. This collection has become an all-time favourite, in part due to its comfort, ease of movement, and flow whilst walking. The Blanchefleur has been a part of most collections since 2010, including collectible limited edition versions of the frock. Lydia Trousers in our Signature Natural Linen, shown with the Cordelia Dress and Vest. 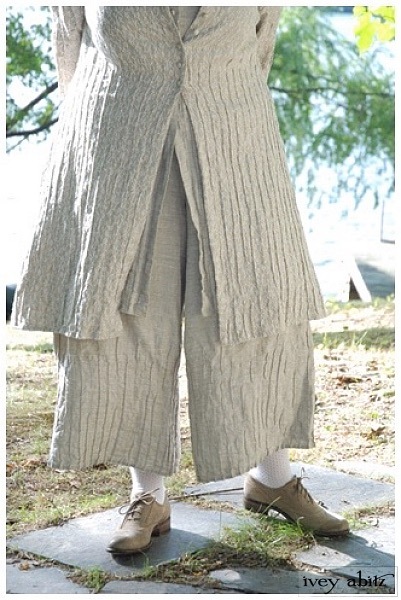 Ivey Abitz trousers have become essential garments for many. They wear like a trouser yet have the ease of the skirt. This is due to the clever design of an extra long rise and a flat front/elastic back waist. The Lydia Trousers debuted in 2010, featuring hand sewn and folded pin tucks. The first IA trousers were designed in 2004 and debuted officially in 2006. Since 2011, many design debuts feature a versatile jacket or duster over one of our frocks with intricate detail along the bottom hem. This combination is now a signature pairing in the collection. Fennefleur Frock in plaid cotton with an Amorette Shirt Jacket in an extraordinary wool knit. Photographed in Lake Huron and appropriate in any body of water. The Fennefleur Frock debuted in 2011 and became a favourite with long-time clients who began collecting several in various fabrics. Each frock is one-of-a-kind because the intricate bottom hem pleating and gather detail respond differently to each weave. Its versatility and whimsy has been part of wedding ensembles in a silk brocade, as well as casual cottons and linens for everyday enjoyment. 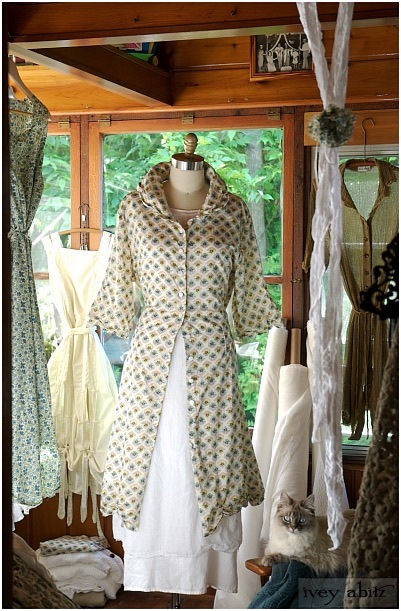 The Phinneus Coat Dress is shown in an embroidered silk organza over a plaid linen Tilbrook Frock. 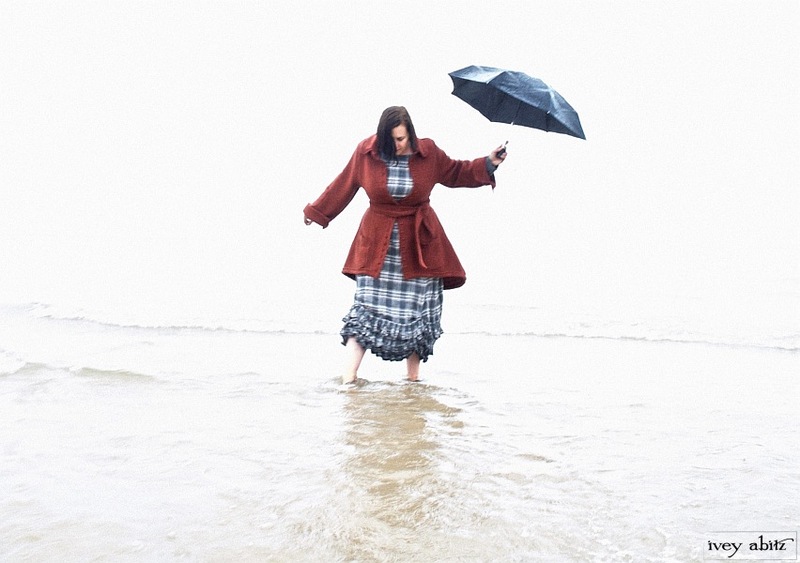 The Phinneus made a splash in 2013 when it debuted alongside the Tilbrook Frock. It soon became a favourite coat dress for many and is now an Ivey Abitz staple. Its versatility and thoughtful design details allows it to be worn with most everything in the collection. With a simple change in the fabric, it can be worn in any climate for any occasion. In an airy and lightweight weave, it is a summer duster. In an opaque cotton or linen, it is a dress that can be worn on its own. In a thicker weave, it is an outdoor coat for cooler days. Hambledon Duster Coat in black silk linen over a Hambledon Frock in a solid grey weave. The base layer is a Fennefleur Frock in plaid cotton. The Hambledon Duster Coat and Hambledon Frock became instant favourites in 2014 during their debut. With lightweight fabric weaves, enjoy the layering depth of the duster coat and frock together, even in the warmest climates. Truitt Jacket and Fennefleur Frock with the old Wagoneer in the snow. The Truitt Jacket debuted in 2013 and made a feature in the Winter 2013-14 Collection. Its flattering curved neckline and bottom hem allow for an effortless pairing over our frocks (it is shown here with the Fennefleur Frock), skirts, and trousers. The Truitt collection has since grown to include a duster coat, frock, vest, and shirt. These are but a taste of the last decade of debut designs from Ivey Abitz. If you see something in this article that you like, please inquire and we will help you order it or find something similar. Did you like this article? It’s part of Authentic Everyday. Buy the magazine.